There’s always some happening at Bauman Orchards. From huge events like our annual Fall Festival to more intimate events like our Tree Pruning seminar or our School Tours programs, we enjoy connecting with people in the community. Looking for something fun to do this weekend? We welcome you to browse our events listing below. School tours provide an interactive and enriching environment where children can learn about our orchard while they have fun at the same time. With all the fun and excitement, our annual event certainly draws a crowd. We welcome you to join us to celebrate the fall season. There's something for everyone! 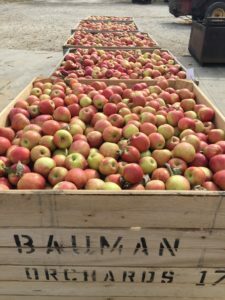 Bauman Orchards invites you and your family to enjoy the orchard when you pick your own apples. If your family loves strawberries, then this event is for you. Join us for a lively day full of activities, food and music that is all-things "strawberry"! Tree pruning techniques for your backyard orchard will be discussed and demonstrated at this two hour seminar. This event happens every two years, so watch for information on our next seminar to be held in 2020!